After my first operating session with car cards, I made one significant change, then started running some CP trains. Here are a few videos showing the trains. I added a train information card to the front of the card packet. This gives the train number, origin and destination of the train, departure time, and switching instructions en route. I’m not using the maximum cars yet, and the departure time is only used to determine the sequence of trains. At some point I’ll jiggle the times to set up meets in Georgetown. I’ve seen one problem already – the train number is hidden by the clip. Rev 2 will be better! CP 976, aka the Minnedosa Local, was the first to run. The train had GMTX 768, five cars and a caboose, which is about the longest train you can stash in the Minnedosa sub / staging without the head end being visible. 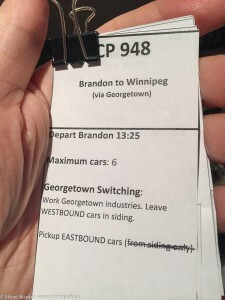 CP 976’s instructions are to proceed west to Brandon, dropping any eastbound cars in the Georgetown siding and picking up any westbound cars from the Georgetown siding. As it happened, the train had two eastbound grain hoppers that it had to drop. There was nothing to pick up so it was a relatively short run. CP 948, the Brandon-Winnipeg (eastbound) train was next. This is the busiest of the four CP trains I have on my layout. CP 948 runs from Brandon to Winnipeg through Georgetown, and works Georgetown industries while it’s there. The switches to the three CP-based Georgetown industries (warehouse, team track and grain elevator) and the CN-CP interchange track have eastward-facing points, so an eastbound freight can work them easily. 948 was short coming out of Brandon, with only three cars and a caboose behind big MLW CP 4505. They had one BN car for the CN-CP interchange, an eastbound scrap gondola, and a centerbeam flatcar for the team track. There was lots of work to do in Georgetown. The three boxcars at the warehouse had to come out, the interchange track had two cars and a locomotive to remove and deal with, and the team track had a car that was heading out. I had to split this into two videos to stay under the 15 minute YouTube limit. In part 2 they switched the warehouse and put their train back together before continuing on to Winnipeg. The next train is CP 949, the Winnipeg-Brandon train, followed by CP 975, the local going back to Minnedosa. Neither of them have much work in Georgetown so they should be quicker to operate. Read on!